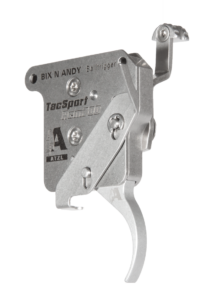 Bullet Central and Bix’n Andy will launch the all new TacSport version of their match trigger in January. The new TacSport ball-triggers from Bix’n Andy will likely be the most exciting product announced in years. Bix’n Andy Competition Triggers have taken the world by storm, winning world titles and setting new benchrest records. Now, for the first time, the same patented ball system comes to the sporting rifle. Designed to operate in Remington 700 and compatible actions, the new triggers will have an adjustable pull force between 10 ounces (300 grams) and 4.5 pounds (2 kg). The ball system allows for the lowest reset force of any trigger, thereby improving accuracy and allowing for a very crisp let-off. Joe Walls, a top PRS PRO competitor has this to say about Bix’n Andy: “The Bix n Andy is the true Ferrari of triggers! I have used every Trigger available in the US and the BnA is the most consistent and creep free trigger made. From the pouring rain in the east to the drought stricken dusty and windy west the BnA has never let me down”. Tony Boyer, the best benchrest shooter of all time says: “This is the finest trigger to have ever touched my finger”. The TacSport will be launched in single and two-stage versions. Both are aimed at the hunting and fast-growing tactical markets. The TacSport is machined from stainless steel with a housing designed to further protect the mechanism from the elements and will come standard with a safety lever and a removable bolt stop. The starting price will be very competitive at under $250! Bix’n Andy products are precision machined in Austria and sold in North America, Africa, Australia and South America by Bullet Central out of Fargo ND. Bullet Central will launch the TacSport triggers at the 2017 SHOT Show in Las Vegas, Nevada. Todd, manufacturing is just getting ramped up and we still need to work out the availability date. Right now it’s looking like April. If you want a trigger, call or email our office with your name, phone number and email address and will put you on the list. Thank you, if you need anything else feel free to give us a call at +1 701 371 4444 or send us an email at sales@bulletcentral.com.